Landscape wants and needs can sometimes be shuttled into an area of expectation without a real dialogue. Here at Paradise Designs Inc. our designers listen to your ideas and strive to blend your vision with our extensive design expertise. Our goal is to design and build a project that will reflect your desires and be the best fit for the lifestyle needs of you and your family. There are many aspects to consider when designing a project from wish lists, to realistic yard usage and maintenance concerns. These consideration all require careful discussion along with realistic budgetary restrictions before we move into design and ultimately into the build phases of a project. Yard use falls pretty high on the priority list. The functionality of the yard is of utmost importance. We like to find out if you will be primarily using the yard for family functions or adult entertaining. Do you, the client, have pets that require lawn or specific play areas or areas of containment? Each will clearly affect our approach to your dream paradise. On occasion there may be special needs for elderly or handicap access that need to be addressed? 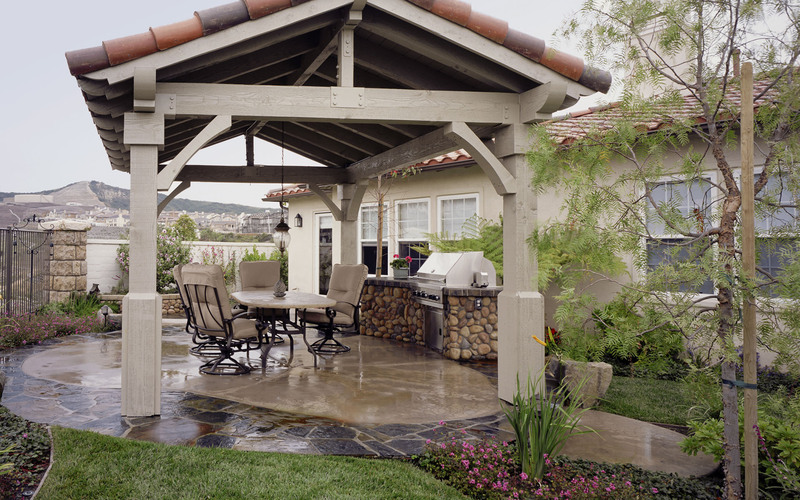 Additionally, imagining the use of patios, decks, gazebos and play areas can significantly change our approach to your yard. Not only is it important to consider these hardscape features but it is vital to discuss size expectations. Do you envision an intimate patio where the two of you can have morning coffee or an entertainment area with a tv, fireplace, and outdoor room perhaps for larger groups? All of these hardscape areas can lead to the inclusion of pools, hot tubs, ponds, sculptures, fire pits and fountains into the design concept. Other design considerations include your preferred aesthetic. Do you enjoy a formal or informal approach? Would it please you to have a naturalistic curvilinear approach or a more modern angular approach? If water features make your waterwise consciousness tremble, we can reassure you as today’s water features generally recycle their water to maximize water efficiencies. However, if your taste runs more toward an arid landscape look, we can incorporate dry creek beds and other arid elements including decomposed granite pathways, rain barrels to collect rainwater from roofs that can be redirected into the landscape, and smart irrigation. Every large-scale consideration leads to details that will flesh out the design you ultimately want, need and imagined. It is our goal to have the finished product lead to your enjoyment. In the meantime, don’t hesitate to give us a call. We welcome questions regarding the Paradise Design teams ability to meet your needs and wants.